Bolens lawn tractors are manufactured by the MTD company. This tractor line represents an entry-level product for MTD. Typically sold at large home improvement outlets, these tractors were built with price in mind. At this time, there is only one version for sale, the model M762F. Bolens allows for the ‘3 in 1’ option,with features for side discharge, mulch, or bagging. Additional accessories ( costing more) are required for the triple option.The deck cutting height is adjusted manually using a lever. Five different heights are available, from 1.5” to 4”. The front axle on this machine is fabricated of steel. Although sturdy, a steel axle is less dependable and wears out quicker than the cast iron axle found on more expensive tractors. The deck design on the Bolens lawn tractor features the ‘step through’ design. This eliminates any obstructions in front of the drivers seat. This allows for easy entry and exit from the tractor without the need to lift feet and legs over a raised portion of the frame. The Bolens model M762F comes standard with a 15.5 HP side valve Briggs and Stratton side valve engine. It does not come equipped with an oil filter. This is a reliable engine which has stood the test of time. However, the horsepower rating is on the low end of the power scale for a riding tractor. Bolens compensates for this by fitting this tractor with a smaller cutting deck and a manual transmission. The cutting blades are engaged using a manual PTO system. The 38” deck is equipped with 2 cutting blades. Count on spending between $900.00 for this tractor at Lowes. 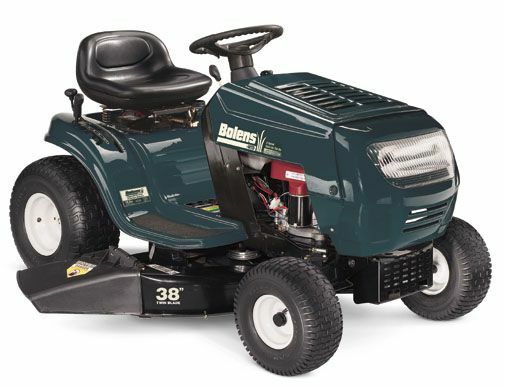 For those customers looking for an economically priced lawn tractor, the Bolens model M762F may be the machine for you.